This post is provided in partnership with Expedia.com. 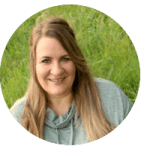 Gatlinburg, Tennessee is the gateway to the Smoky Mountains and has been one of my family’s favorite getaways since our very first visit when my kids were young. 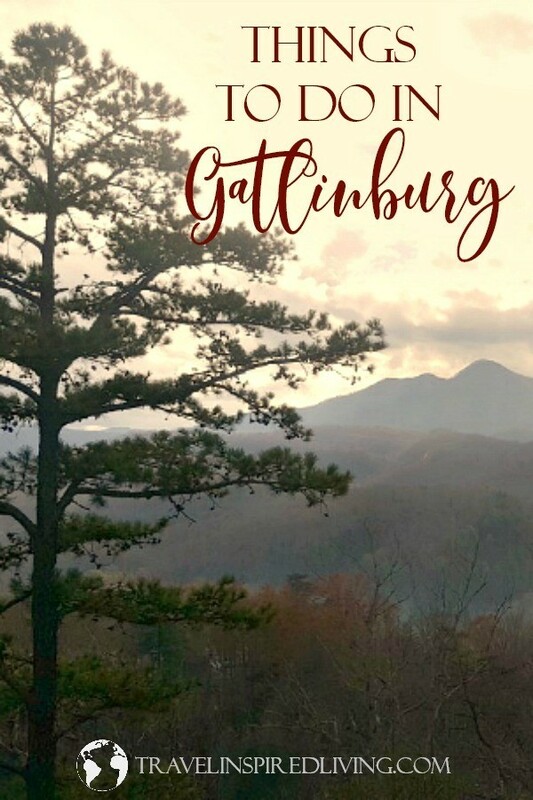 While our very favorite attraction in Gatlinburg has always been the Great Smoky Mountain National Park, there is no shortage of things to do in Gatlinburg and truly something for everyone. Outdoor adventure travelers love the easy access to the national park. With hikes ranging from wheelchair and stroller accessible to challenging hikes along the Appalachian Trail, hikers will find their true bliss. Families love Gatlinburg for the kid-friendly attractions, while couples will find Gatlinburg a great place for a romantic getaway. Whatever your hobbies, you’re sure to find something you love. Today, we’re sharing a list of our favorite area attractions but let’s talk about important things first, like where to stay in Gatlinburg. In addition to quite a few hotels, you’ll also find a plethora of cabins to stay at in the area. 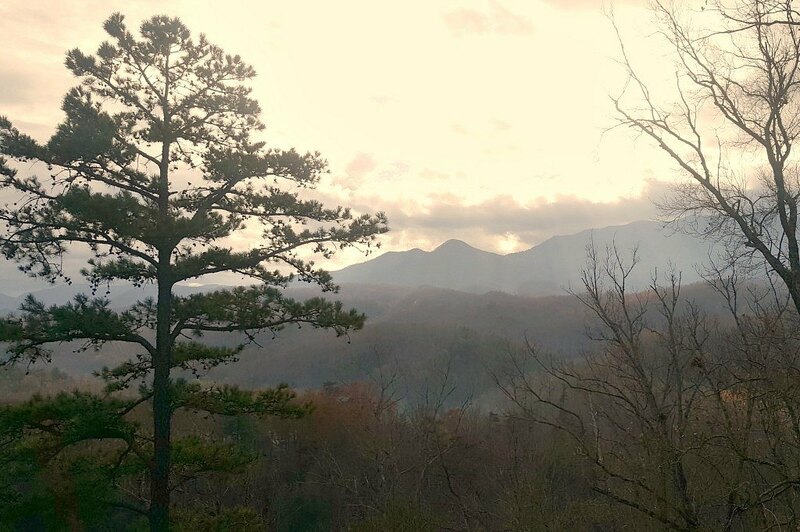 A short drive from downtown is Gatlinburg Falls, a community of luxury cabins that offer family’s, couples or groups of friend’s space to spread out and relax after a full day of exploration. The cabins are so nice that you may be tempted to stay in the cabin your entire trip and enjoy the views from a rocker on your porch, soak in the hot tub or get a bit competitive in the in-cabin game rooms. How could you go wrong? To find accommodations, visit Expedia.com Gatlinburg hotels. 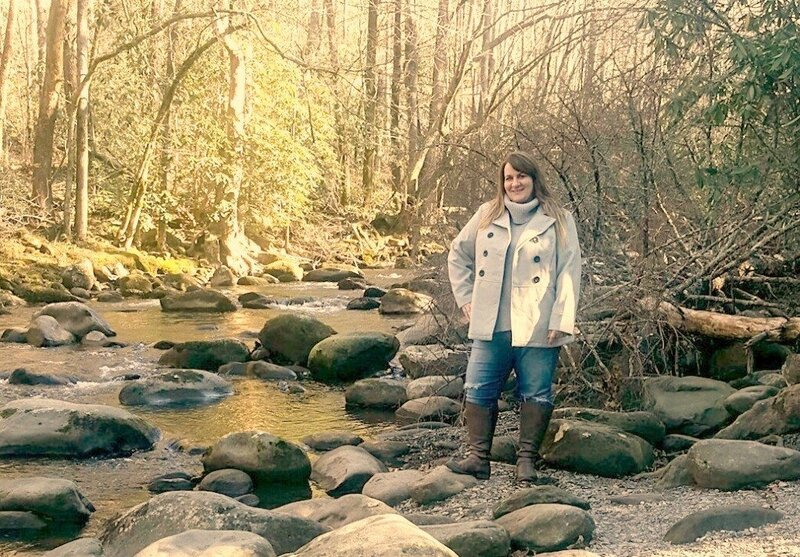 The first time my family visited the Smoky Mountains, we stayed at the Westgate Smoky Mountain Resort and Spa. A beautiful property nestled between Pigeon Forge and Gatlinburg, this resort boasts beautiful rooms that range from studio villas to one- and two-bedroom accommodations. If you’re looking for a hotel right on the strip within walking distance of the shopping, food and Ripley’s attractions (including the aquarium) that won’t break the bank, check out the Quality Inn Creekside. This property also an inground pool (in season) and has a large suite with two bedrooms, a living room and kitchenette that my family has enjoyed staying at in the past. Located within walking distance to the best attractions in Gatlinburg, this comfortable and affordable property features spacious rooms (including a large family suite), complimentary wi-fi and a beautiful two-level pool with hot tub. We all have our favorite chain hotels, right? Well, Baymont is one of mine. 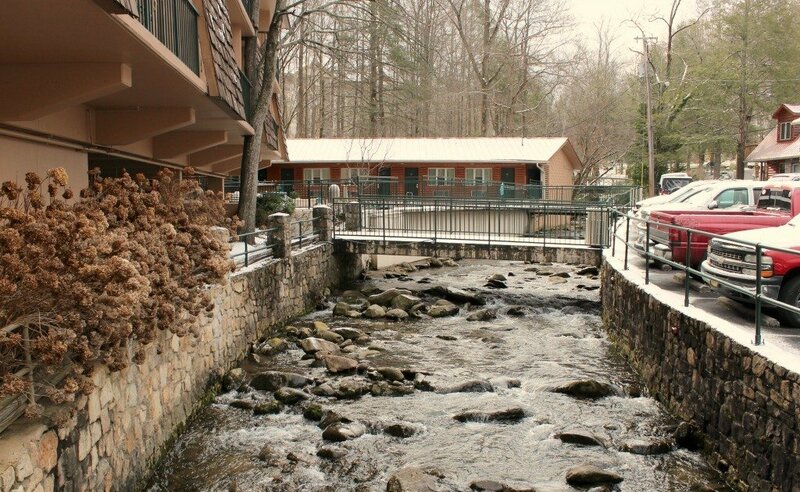 Located right along the river, with an indoor pool and with the national park and ski resort easily accessible, this is a great spot to hang out for a few days enjoying all of Gatlinburg. Enjoy the children’s activities, free wi-fi, and daily breakfast. Finally, sometimes you need or want to take Fido along when you’re traveling. It’s nice to know that Gatlinburg has pet-friendly hotels as well. The Sidney James Mountain Lodge is conveniently located in downtown Gatlinburg, so you’ll be able to park the car and stroll down the strip to popular attractions and restaurants or simply to take your four-legged pal on a walk. In addition to the standard on-property hotel rooms, this hotel also has two cabins that are available to rent that aisalso located downtown. While it’s no secret that I prefer cooking in a hotel room to dining out, once in a while you just need to go out for a great burger or steak. And what you may not realize is that Gatlinburg has been called the “Pancake Capital of the World”. If there was ever a reason to skip the hotel breakfast and rouse yourself from your slumber, this is it. As the oldest pancake house in Tennessee, the Pancake Pantry has had plenty of time to perfect their recipes. This popular restaurant uses real whipped cream and butter on their flapjacks. A visit to the Pancake Pantry has become a tradition for family’s who have been visiting Gatlinburg generation after generation. Hours: Monday-Friday 6 a.m. to 3 p.m. and Saturday & Sunday from 6 a.m. to 4 p.m. Tip: Unless things have changed, this is a cash-only restaurant so make sure you stop at the ATM before arriving. Not a trip goes by when traveling with my family doesn’t crave pizza. Mellow Mushroom is located right on the Parkway and is an easy walk from most downtown hotels. This eclectically decorated restaurant has an upbeat atmosphere and provides a fun dine in experience or if you prefer a quiet evening, order your pizza or calzone to go. Hours: Sunday-Thursday 11 a.m. to 12 a.m., Friday & Saturday from 11 a.m. to 1 p.m. This locally owned and operated steakhouse is located near hotels and lodging but not right downtown, offering a change of scenery and perfect location for those traveling on a romantic getaway. 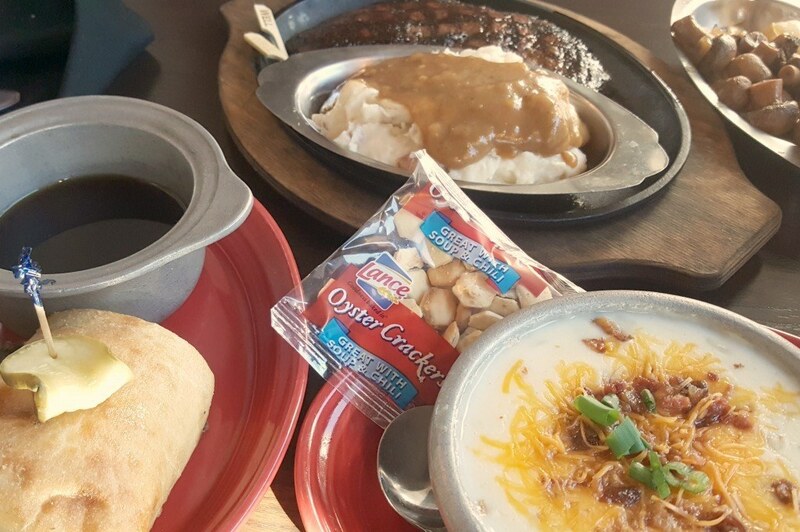 With locations in both Pigeon Forge and Gatlinburg, you’ll find plenty of food options, an attentive staff, and portions to fill your belly. Hours: Sunday-Thursday 11 a.m. to 10 p.m., Friday & Saturday from 11 a.m. to 11 p.m. Tip: The Alamo Steakhouse is very busy. To avoid the dinner crowd, try stopping at lunchtime instead. You’ll even save a few bucks off the check. 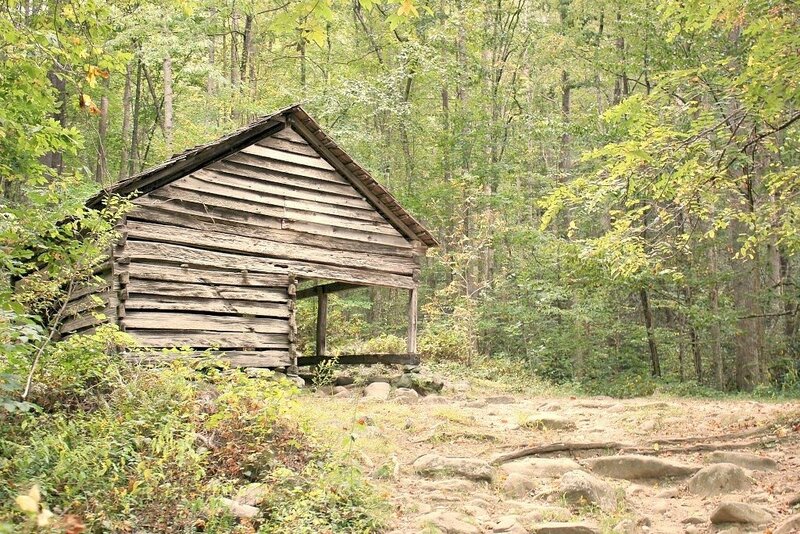 This national park, nestled in the heart of the Smoky Mountains, offers free admission. The combination of the beauty of the mountains and diverse hiking makes this the most visited national park in the United States. From Gatlinburg, begin your visit at the Sugarland Visitor’s Center. Watch the movie, explore the exhibit and pick up souvenirs and maps that detail the hiking trails of the area. The Sugarlands Valley Nature Trail is a few minutes from the visitor center and offers a paved, flat trail along the river that is perfect for strollers, wheelchairs or to warm up before hiking more ambitious trails. While there is plenty to see in the Smokies, my favorite aspect of the park near Gatlinburg is the Roaring Forks Motor Trail. This one-way scenic trail allows visitors to see some of the historic cabins in the park with a few spots to get out, stretch your legs and possibly spot a waterfall or two. Note that this trail is open seasonally. Seattle doesn’t have dibs on space needles! Gatlinburg has a 407-foot space needle with an open-air observation deck that gives you 360-degrees views of Gatlinburg and the Smoky Mountains. Your ticket covers two rides up, meaning you can view it in the daytime and return at night if you wish to see the twinkling lights of Gatlinburg. The space needle also has an arcade with games for kids and a small gift shop. For a taste of what’s in store, you can always check out the webcam from the Gatlinburg Space Needle. Hours: Sunday- Thursday 9 a.m. to 12 a.m., Friday & Saturday from 9 a.m. to 1 a.m. If 400 feet isn’t high enough for you, then check out Gatlinburg Sky Lift, an open-air chairlift that ascends 1,800 feet over Gatlinburg. The Sky Lift has been operating since the 1950’s, making it one the oldest attractions in the Smokies. Some of the structures here were damaged in the 2016 fire, but the SkyLift is running and a new SkyDeck and SkyBridge will be opening this fall, allowing visitors to exit the chairlift at the top and enjoy the views for a while before descending back down the mountain. We love all things kitsch at Travel Inspired Living, so naturally, the Salt and Pepper Shaker Museum makes our list of things to do in Gatlinburg! The United States’ only Salt and Pepper Shaker Museum has over 20,000 sets of salt and pepper shakers, plus a pretty large collection of pepper mills to boot! Your $3 admission fee also serves as a $3 coupon in the gift shop, so you can get started on your own salt and pepper shaker collection. Ripley’s Believe It or Not! Odditorium – The original Ripley’s concept. 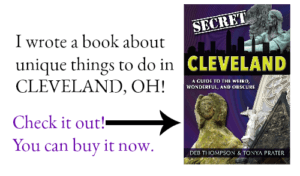 More than 500 oddities spread across three stories of interactive exhibits. 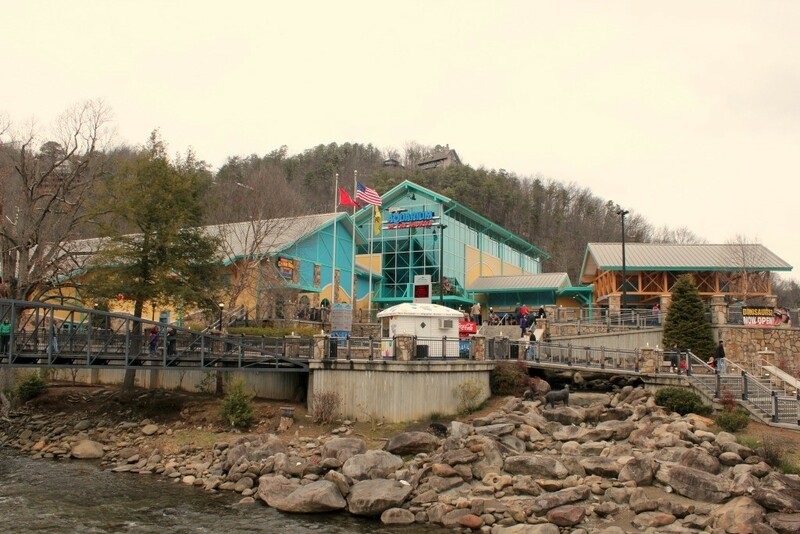 Ripley’s Aquarium of the Smokies – Houses more than 10,000 individual sea creatures from 350 species, including a glass tunnel under the shark tank. Hours: Monday-Thursday 9 a.m. to 9 p.m., Friday- Sunday 9 a.m. to 10 p.m.
Ripley’s Haunted Adventure – Rated the best haunted house in Gatlinburg, and you don’t even have to wait until Halloween, as it’s open every day of the year. Hours: Monday-Thursday 10 a.m. to 11 p.m., Friday- Sunday 10 a.m. to 12 a.m.
Ripley’s Mirror Maze – This Gatlinburg attraction takes the funhouse mirror maze to a whole new level with a labyrinth of LED lights and mirrors. Ripley’s Mini Golf – two miniature golf courses in the Gatlinburg area. Davy Crockett Mini Golf has 36 holes and Old Mac Donald’s Farm has 54 farm-themed holes in nearby Sevierville. Tip: If you plan to visit the Aquarium, consider pairing your visit with another attraction which can save you substantially. View all the available packages at www.ripleys.com. For live entertainment in Gatlinburg, head to the Sweet Fanny Adams Theatre. Musical comedy shows are performed in a family-friendly Vaudeville style, in an intimate setting of this small theater. The theatre is in its 42nd season, with up to six shows per week in peak tourist season. If you are visiting Gatlinburg in winter, a holiday program runs from Thanksgiving to New Year’s, when the theatre goes on hiatus until Spring. This amusement park in Gatlinburg is home to the world’s first mountain glider, a single rail roller coaster that lets passengers fly through the air, like a zip line. 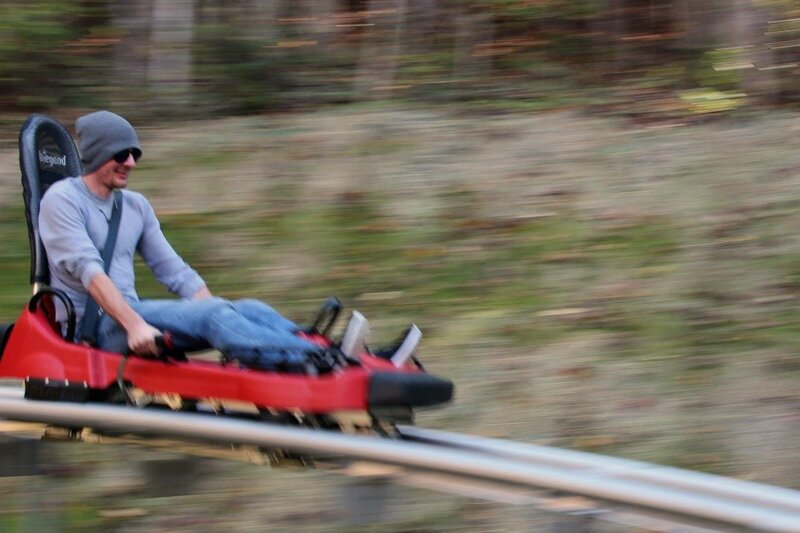 Rowdy Bear Mountain also has an alpine coaster, called the Gravity Coaster, a mile-long alpine slide with a self-braking feature that allows you to control your speed as you descend through the woods. Tickets are sold on an individual ride basis, but you can purchase combo tickets or one-hour unlimited wristbands. Hours: Sunday-Thursday 10 a.m. to 10 p.m., Friday- Saturday 10 a.m. to 11 p.m.
Another aerial adventure in the Gatlinburg area is Zip Gatlinburg. Nine zip lines have you cruising through the treetop canopy. Children as young as five can experience this fun adventure, and you will always have expert guides accompanying you. If your Tennessee vacation includes a visit to Pigeon Forge, you can purchase a combo ticket that includes the sister property of Zip Gatlinburg, which is The Dome Zipline course. Zip Gatlinburg is perfect for first-time zipliners, but adventurous enough for seasoned pros! Hours: 7 days a week from 9 a.m. to 6 p.m.
Gatlinburg is a hub for whitewater enthusiasts who want to experience the thrill of river rafting. The nearby Nantahala Outdoor Center is the nation’s largest outdoor recreation tour company. They offer more than 120 outdoor adventure itineraries, including several whitewater trips on the nearby Pigeon River. There are dozens of whitewater rafting outfitters to choose from in Gatlinburg, and different sections of the river offer varying levels of rapids, so even families can find a stretch of river that suits them. Anakeesta is a Gatlinburg theme park that offers a unique outdoor family experience. Admission includes a gondola ride to Firefly Village at the top of Anakeesta Mountain. In addition to spectacular views, Firefly Village has gift shops and dining, including a BBQ food truck and an ice cream parlor. The Tree Canopy Walk has 16 bridges suspended 40 to 60 feet above ground, giving guests a birds-eye view of the Smoky Mountain forest. There’s also a kid’s playground and Memorial Forest Walk, dedicated to the 2016 fires in this area. And for the adrenaline junkies in the group, Anakeesta has a zip line course and a mountain coaster. Hours: Sunday-Thursday 10 a.m. to 8 p.m., Friday- Saturday 10 a.m. to 8 p.m.
Gatlinburg isn’t just for kids! For adults looking to relax and enjoy wine or other local spirits, there are many options for tasting tours in the Gatlinburg area. Whether you’re looking for a craft beer, local wine or Tennessee moonshine, Gatlinburg has you covered. For wine, check out Tennessee Homemade Wines, Gatlinburg Wine Cellar, Sugarland Cellars or Smoky Mountain Winery. Smoky Mountain Brewery has six flagship beers that are always on tap, plus up to four seasonal brews throughout the year. Gatlinburg distilleries include Doc Collier Moonshine Distillery, Ole Smoky Whiskey Distillery, and Ole Smoky Moonshine Distillery. One of Gatlinburg’s unique attractions is the Christ in the Smokies Museum and Gardens. With self-guided tours starting every 15 minutes, visitors can walk through life-size scenes from the life of Jesus Christ. After walking through the museum, takes 45 minutes to an hour, you can stroll through the gardens and enjoy some peace before continuing your Gatlinburg vacation. There is also a prayer garden and a gift shop with various religious keepsakes for sale. Tip: Purchase tickets online to save money. This three-story Victorian home has been converted into a haunted house that is open year-round for self-guided tours. Live actors add to the fear factor as you make your way through winding staircases, dark hallways and secret passageways. Check the events calendar for special presentations throughout the year, especially leading up to Halloween. Not recommended for small children! Hours: Monday-Thursday 4 p.m. to 11 p.m., Friday- Sunday from 5 p.m. to 12 a.m.
Special Halloween presentations are available each weekend in October for $2 more per ticket. Please note that children must be accompanied by an adult. Take home a one-of-a-kind souvenir from your trip to the Smokies when you explore the 8-mile loop of artisans, galleries and restaurants nestled along the mountains. Known as the largest organization of independent artisans in the United States, you’ll find a broad range of items that include pottery, woodworking, metal sculpting, paintings, furniture, even custom-made knives and so much more. 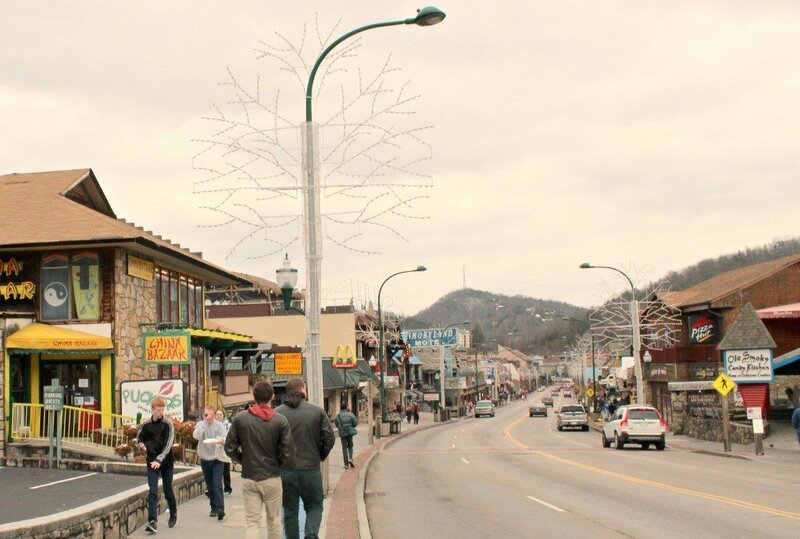 If you love arts and crafts, friendly people and beautiful views, Gatlinburg’s Arts and Crafts Community is sure to be a hit of your visit to the area. Hours: 7 days a week 10 a.m. to 5 p.m. Tip: Parking can be a bear so leave your vehicle at your hotel and hop on the trolley. 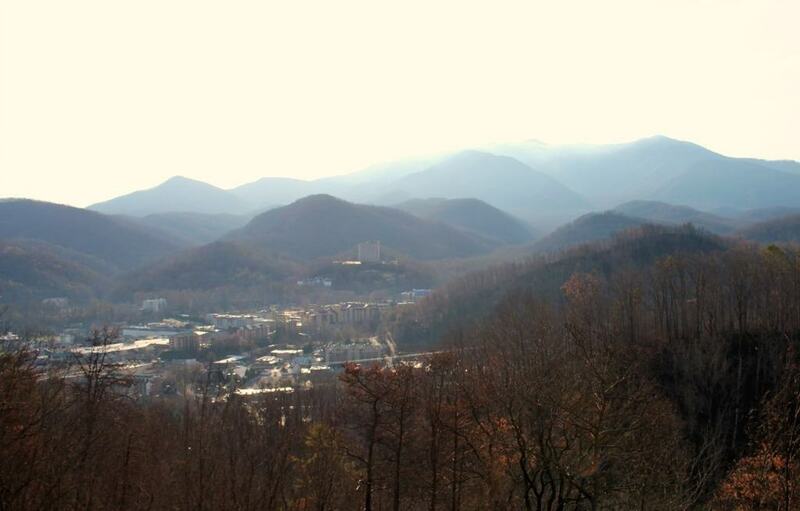 What’s your favorite thing to do in Gatlinburg?